As the scientific name implies, the pummelo is the largest of all citrus fruits. Unfortunately, it is also sold at an inflated price. 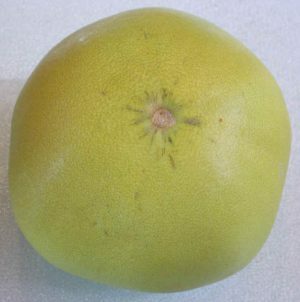 The pummelo is the fruit from which the modern grapefruit was developed, but they are much sweeter than most grapefruits. When purchasing pummelos, select the heavier solid fruit and avoid the light weight ones, as they are of inferior quality and most likely dried out on the inside. They are easy to peel and relatively easy to section. One of the delightful features of the pummelo is its wonderful aroma which emanates from the peel. See nutritional information below. 1 Vitamin A and carotenoid values are based on white variety.